Car Accident Settlement Funding: How much can I get? If you’ve been injured in an accident and need cash now, a pre-settlement advance (aka a lawsuit loan) can be a valuable resource toy help you get by financially until your lawsuit gets resolved. Pre-settlement advances are typically available for motor vehicle accidents and other types of personal injury cases. These cash advances are used to cover general living expenses, housing costs, motor vehicle repairs and medical expenses. This article will better inform you as to how much of an advance you may eligible for against our lawsuit. One of the most common questions we get at Bridgeway is how much of a cash advance can I take against my accident. While each individual case is slightly different, there are some basic guidelines you can use for most cases. 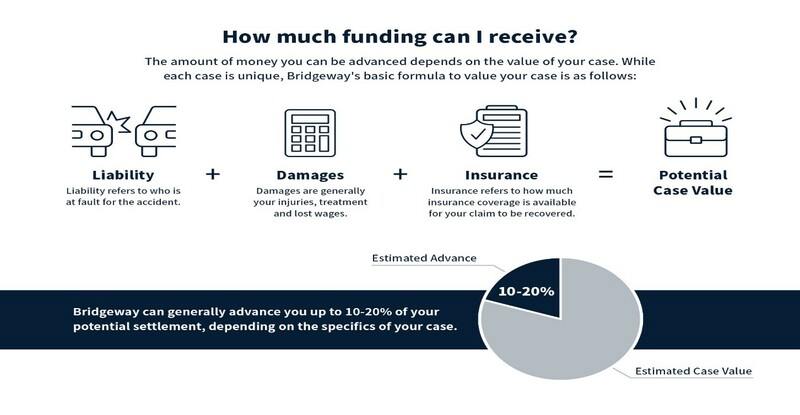 For starters, Bridgeway can typically advance 10-20% of the value of a case. The percentage that we can advance will depend on the type of case, the geographic location of the incident and how far along the case is. Liability: Who caused the accident? If you are a driver in a motor vehicle accident you typically need to be less than 50% at fault to pursue a claim. If you are a passenger in a motor vehicle accident you would likely have a claim against whichever driver caused the accident. In fact, as a passenger, if another vehicle caused the accident you may be able to recover from both car that caused the accident and from the vehicle you were in. Damages: Damages typically involve both physical injuries to your body but also monetary losses such as lost wages or future loss of earning potential. -Injury: when it comes to injuries, insurance companies will look at number of factors to determine what your injury is worth and what you should be compensated. Some of the factors include: the dollar amount spent on your medical treatment, the type of injury, what type of medical treatment was needed to get you back to maximum medical improvement, how long treatment was needed, pain & suffering and potential future medical expenses. -Wage loss. The first part of a wage loss claim is typically the amount of work you have been forced to miss multiplied by your wage. The second part of your claim will be for loss of future earnings. That could include not being able to return to work for a period of time, if at all, because of your medical condition. If you have lost your job due to the accident or are having to take on a different type of job because of your injury at lower wage, that would typically also be included in the wage loss equation. Insurance: Insurance is a key factor in determining the value of one’s case. In the United States every vehicle on the road is legally obligated to have insurance. Each state has a minimum legal limit they must carry. For example, in many states, a passenger vehicle minimum insurance limit is 25/50. That means that as a plaintiff you can sue for up to $25,000 per person or if there are multiple people injured there would be a cap of $50,000 per accident that the insurance company would be obligated pay. For a complete list of states minimum car insurance limits visit: Car Insurance Minimums. For individual car owners, policies can be as much as $500,000 + unlimited additional umbrella coverage. Most states have significantly higher minimum limits for commercial vehicle and trucks. It is common for commercial vehicles to have $1,000,000 or more of insurance coverage. Under insurance or uninsured motorist insurance can also be an important factor. This is additional insurance you can elect to carry on your own vehicle. This will protect you should you be involved in an accident with someone who does not have insurance or doesn’t have enough insurance to compensate you for your losses. In summary, to determine an estimated value of a lawsuit we would review liability, damages and insurance. Once we have reviewed these factors Bridgeway will typically advance up to 10-20% of the value of a case. The range depends on the type of case, the value and where along the process the case is. For example, if Bridgeway thought your case was worth $50,000, we might be willing to advance up to $5,000 - $10,000 on your case. While pre-settlement advances are sometime referred to as “lawsuit loans" they are not actually loans, but are non-recourse advances against your case. In the case of a non-recourse advance, if for any reason your case is unsuccessful, you would not owe Bridgeway any part of the advance back and the money is yours to keep. Auto accidents are quite common; There are roughly 2.3 million people injured every year in the United States just as a result of car accidents For many people, these accidents can cause financial hardship & distress. Bridgeway Legal Funding makes cash advances to help people get through a difficult time and to help them avoid accepting offers that are well below the fair value of their case. To apply with Bridgeway, please click here or to learn more about what pre-settlement funding is and how it works click here.